Now that you have a dialed-in customer value proposition, we can focus on a more advanced marketing strategy. And since your customer service is legendary — literally leap-years better than what your competitors provide who are still letting customers fall through the cracks — it’s now time to ramp up. Here’s a fun, effective strategy that can be a home run campaign for you, that, for your sake, I hope you build into your marketing calendar. This strategy works because most businesses overlook their best asset, their customers. In fact, I recently executed this strategy (a sequential series) for one of my favorite long-time customers. We communicate to past customers that haven’t purchased within the last 12 months (this number varies based on your sales cycle). You see, with rare exceptions, most companies can improve their marketing communications systems. That is, they can communicate more value to their customers, more often. And for this one company, this strategy has generated over $1.5 million in newfound sales since we started. When I reviewed their analytics and saw what they were doing, and not doing, I immediately saw this overlooked opportunity. So, today, here is a foundation of that campaign. I wrote this specifically for this one organization, but your take-away should be clear. 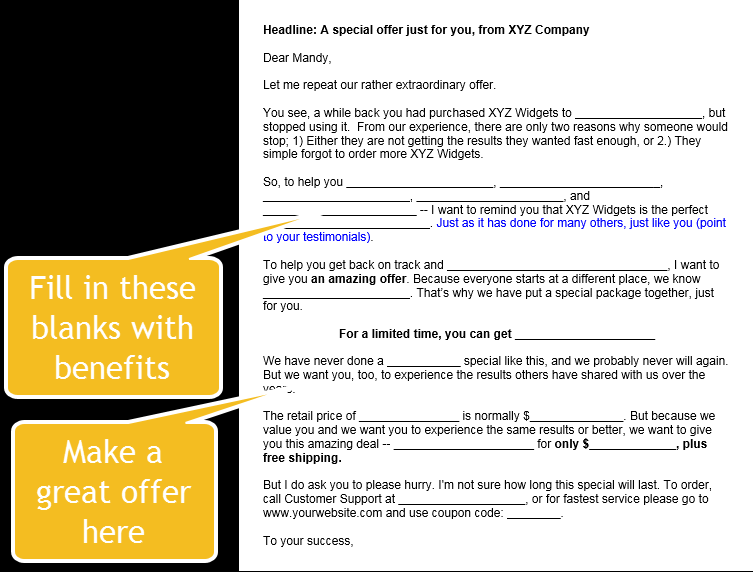 Communicate a high value offer to your old customers filled with lots of benefits – to win them back. After all, why would you want to spend 10x the advertising dollars “trying to find and educate a new person on why you exist” vs spending 1/10x the advertising money on “someone who already knows you and your quality services”? It just makes sense. And you will see how much financial sense its makes when you test it for yourself (Call me at 602-892-0777 as I’d love to help you execute this awesome strategy). Project Overview: Take 2,000 names of old customers and do an equal A/B test to 1,000 each. As an example, you can do a special 2x offer vs a 3x offer and then throw in a special upsell to both lists for additional products at a “never-been-before-and-will-never-happen-again limited-time-only”. The attitude here is to assume they want it and make a great offer and simultaneously test a new package deal that we could roll out to the entire list in a periodic special. I invite you to call me, so together, you and I can develop a campaign similar to this for your business. You’ll only win. Actually, the only you could lose is if you don’t call me.